Once a substrate (concrete or wood) is covered with an underlay, the concrete or wood becomes the subfloor and the underlay is the substrate. The match up of underlay material to the flooring product is crucial in the performance and integrity of all LVT and laminate flooring installations. 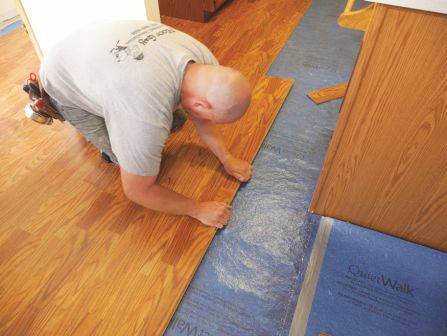 The underlays for installing these flooring products are different and should not be used interchangeably. A laminate underlay is normally too soft for the LVT and products designed for LVT are too thin and stiff for laminate planks. Both products (LVT and laminates) use a floating click system, with the LVT advancing in market share. The popularity of these floating systems lies with their ease of installation, less installation time, maintenance simplicity, and adhesive is not required. The types or styles of underlay products are many, with having a characteristic specific to the flooring product’s intended use. Each has a primary purpose to protect the floor covering from substrate initiated or related damage. The underlayment materials work with a floating system, luxury click vinyl tile/plank (LVT), and laminate click planks. There are three specific purposes for the underlay materials: sound reduction/absorption; moisture retarder; and a solution to unevenness or slight depressions in the substrate. Once a substrate (concrete or wood) is covered with an underlay, the concrete or wood becomes the subfloor and the underlay is the substrate. 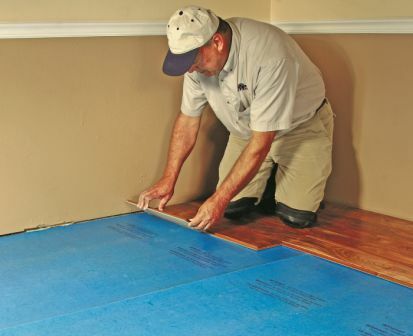 There are many qualities within underlayment materials. It’s highly suggested to review all documentation in relation to manufacturer guidelines. The laminate underlay’s primary purpose is sound transfer (noise) reduction, with a secondary purpose of moisture retarder. LVT (luxury vinyl tile/plank) uses a thin, non-flexible product mostly as a moisture retarder, and in some cases, spanning depressions in concrete or wood and a sound reduction quality, as well. This underlay is designed to protect the LVT from substrate conditions that will create a negative impact on the flooring’s appearance, service life and use. The laminate underlay’s primary purpose is sound transfer (noise) reduction, with a secondary purpose of moisture retarder. Floor flatness is not a consideration for this type of underlayment material, as it is soft, pliable and will lie down into the depressions. Some laminate underlay materials have a tape edge for seams. If not, then you must use the manufacturer recommended tape. Masking tape will not perform. 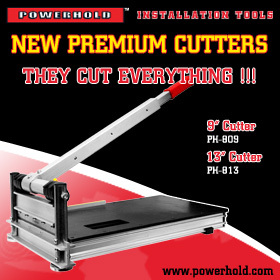 Prior to installation, read the directions and limitations as presented by the manufacturer of the underlay product. And, just as the flooring product, underlay requires acclimation. For both LVT and laminate products, a moisture test of the concrete substrate must be performed, first with an impedance meter. This will show a level of moisture (to be used as an indicator only). If the resulting percentage is above the manufacturer’s recommended level, then further testing is required, such as ASTM 2179 or 1869 F. After the conclusion of the test protocol, a decision can be made for corrective action. 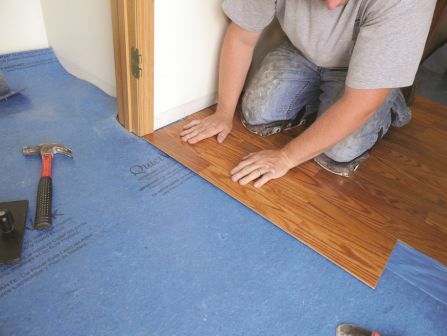 Most of the underlay manufacturers (LVT or laminate) have a moisture emission limit of 4 to 5 lbs. per ASTM 1869F; hence the need of testing prior to installation. 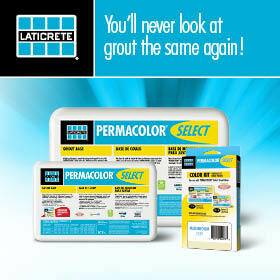 Don’t forget to test the concrete to determine its pH level, the alkalinity (salts). A pH reading higher than 10 will create negative issues along with increased moisture push that will cause an installed flooring failure. For either flooring product, once an elevated moisture condition is discovered, there are numerous epoxy-based products to use. Keep in mind that some form of scarifying, grinding or bead blasting is required to remove the skin layer of concrete so create open pores for the retarder materials to be accepted by the concrete and bond. 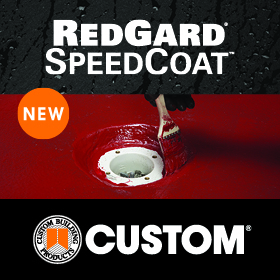 After the retarder is applied, a coating of self-leveling compound may be required, depending on the surface flatness. The underlayment product needs to be matched to the flooring product for construction consistency, as using an LVT underlay for LVT; and laminate underlay for laminate. I have been involved in commercial jobs with multi-thousand square feet of LVT installed, where due diligence was not performed by the installer and the job was redone at three times the cost. At one job, the installer presented to the general contractor a disclaimer because the GC did not want to do a change order, so the $12,000 job went to $40,000. Failures also occur on residential jobs. Consider these situations so they don’t occur with you ‒ use an inferior meter with low battery and a non-readable screen; use a perceived moisture retarder underlay; decide not to use depression flash patching; forget to properly tape seams; and install product under non-moveable objects that restrict expansion and contraction. All of these situations can end with litigation. In closing, the underlayment product needs to be matched to the flooring product for construction consistency, as using an LVT underlay for LVT; and laminate underlay for laminate, pliability to gravity relative spanning depressions, consistency in seams being tight and correct tape used, and finally, the specific qualities of the underlay meet the requirement of the job and specific purpose of use. Both the LVT and laminate products have specific installation guidelines that when read, understood, and followed will insure a successful installation.